VATICAN CITY (CNS) — Ineffective budgetary oversight and “questionable” financial activities have plunged the Order of Friars Minor into significant debt and an extremely serious financial situation, its minister general said. He attributed the situation to unapproved financial activity by some friars as well as non-Franciscans and said the curia had retained lawyers and contacted civil authorities. An investigation begun in September discovered that “the systems of financial oversight and control for the management of the patrimony of the order were either too weak or were compromised, thus limiting their effectiveness to guarantee responsible, transparent management,” Father Perry wrote. The inquiry revealed that “there appears to have taken place a number of questionable financial activities that were conducted by friars entrusted with the care of the patrimony of the order without the full knowledge or consent of the former and current” leaders, he wrote. 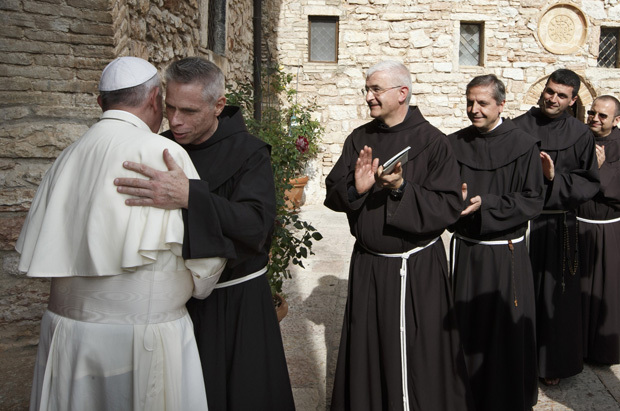 The general treasurer, identified by Italian media as Father Giancarlo Lati, has resigned as treasurer and as legal representative of the order, Father Perry said, and the Franciscans have informed the Vatican about the situation. Father Perry was elected minister general of the order in May 2013 with a mandate to serve until 2015, completing the six-year term of Spanish-born Archbishop Jose Rodriguez Carballo, who in April 2013 was appointed secretary of the Vatican Congregation for Institutes of Consecrated Life and Societies of Apostolic Life. Father Perry had served as the order’s vicar general since 2009. “We must trust that by following a course of truth, God will lead us on the journey of conversion,” he wrote. Father Perry promised to make a complete report on the situation when the Franciscan general chapter meets in 2015.